How much is board? Wow that's a lot! How much is board? Wow that’s a lot! Every boarding facility has the ability to decide what they are going to charge their boarders. Our rates are based on so many variables as well as all the other facilities around. Their is a huge difference in price between self-care, partial care and full care. When I boarded my horses in college, I paid $80/month for self-care. By self-care, I mean I had to feed twice a day, clean my own stalls, do my own turn-out and exercise, pay for my own feed and bedding, but a stall was provided to me. 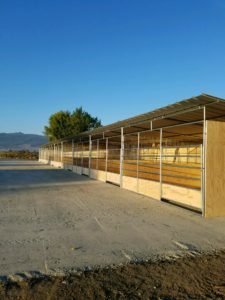 Partial care board generally means that you will have to clean your own stalls while the barn provides hay or you may have to provide hay for your horses, but your stalls are cleaned for you. That would be cheaper board than full care but more expensive than self-care. Full care board does vary by facility but generally includes a stall, cleaning and feeding for your horse. There could be other things included but that is the basic full care option. Full care at LoneStar Riding Academy will include that above and many other options that some barns in our area charge extra for. So what is include in full care at our barn and what does it cost? CALL US TODAY TO FIND OUT WHAT IT COSTS TO BOARD WITH US! !